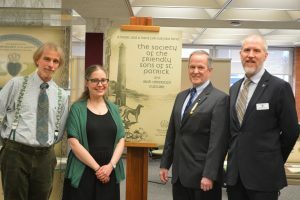 On Tuesday, March 26, we celebrated the 248-year history of the Philadelphia Society of the Friendly Sons of St. Patrick for the Relief of Emigrants from Ireland with music, talks, and an exhibit. 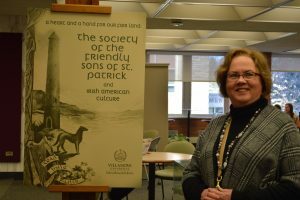 Founded in Philadelphia in 1771, the Society is the second-oldest, continuously meeting Irish organization in the United States. 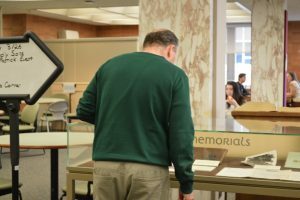 The Society has made a number of contributions to Villanova University and recently partnered with the Library’s Distinctive Collections and Digital Engagement department to digitize their historical materials, which can be viewed in the Digital Library. 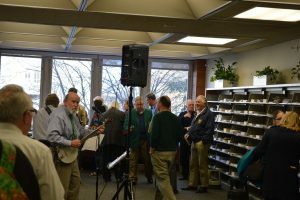 The evening began with a social hour at 5pm, featuring refreshments and live Irish music from the band Irish Mist, featuring featuring Tom McLaughlin on banjo and spoons; Mary Tracy on fiddle, and Paul Harris on bass and guitar. 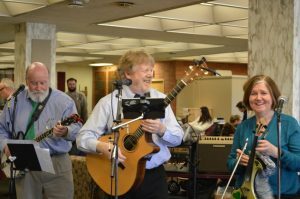 Live Irish music was provided by the band Irish Mist, featuring (from left to right) Tom McLaughlin, Paul Harris, and Mary Tracy. Tom McLaughlin of Irish Mist, looking toward the camera at left, and some of the attendees. Talks began shortly after 6pm. 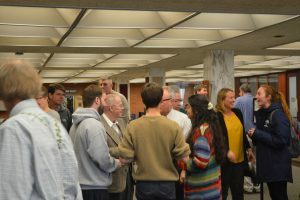 As the exhibit curator and event organizer, I opened with a brief overview of some of the Irish connections in Falvey’s Distinctive Collections. Laura Bang giving an overview of Irish collections. 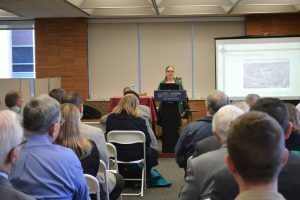 Dr. Joseph Lennon, Associate Dean of International and Interdisciplinary Initiatives and Emily C. Riley Director of Irish Studies, then spoke about the value to scholars of digitizing collections and making them freely available online. Dr. Joseph Lennon speaking about the value of digitized collections. 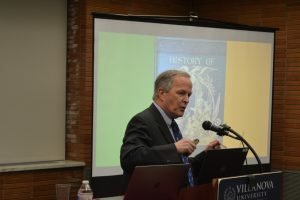 Finally, our main speaker was Joseph P. Heenan, Past President of the Society of the Friendly Sons of St. Patrick and current Chair of the Scholarship Committee and Chair of the Society’s Historical Records. 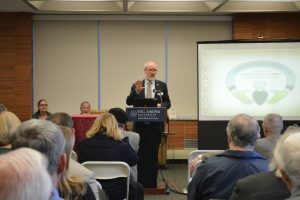 Heenan gave an overview of the Society’s history and accomplishments. Joseph P. Heenan describing the Society’s history. Left to right: Michael Foight, Laura Bang, Joseph P. Heenan, Joseph Lennon. After the talks, people had the opportunity to mingle some more and examine the materials in the exhibit cases. Everyone enjoyed a fun evening in honor of the Friendly Sons! Among the attendees, we were excited to meet Mary Clare Hogan, the daughter of Father Falvey’s (after whom Falvey Memorial Library is named) first cousin. A Falvey celebrity! A man looking at an exhibit case. The exhibit will be on display through the end of May. 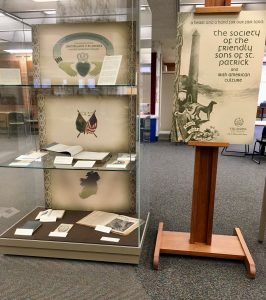 If you can’t make it to the library to see the exhibit, Society materials that have been digitized so far are viewable online in the Digital Library with more to come. All photos courtesy of Regina Duffy, unless otherwise noted. A Scholarship@Villanova lecture featuring Arthur L. Caplan, PhD; The Rev. James J. McCartney, OSA; and Daniel P. Reid ‘14 CLAS will take place today at 3:00 p.m. in Speakers’ Corner of Falvey Memorial Library. 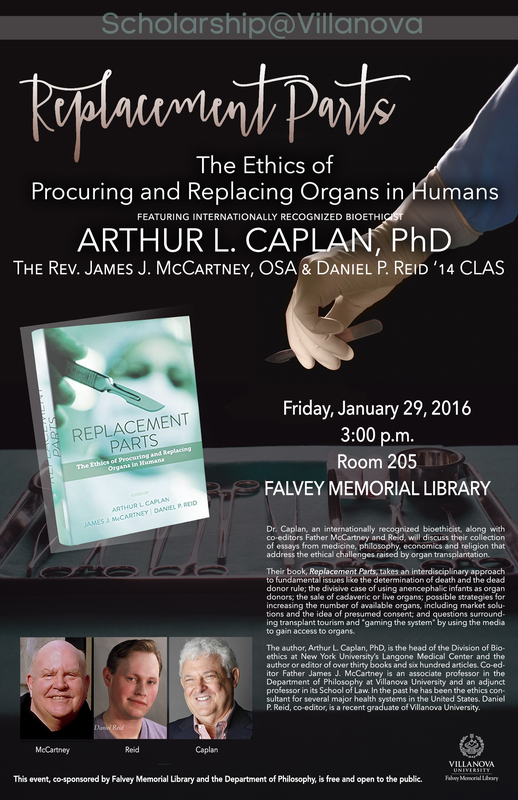 Dr. Caplan, an internationally recognized bioethicist, along with co-editors Father McCartney and Reid, will discuss their collection of essays from medicine, philosophy, economics and religion that address the ethical challenges raised by organ transplantation. Their book, Replacement Parts, takes an interdisciplinary approach to fundamental issues like the determination of death and the dead donor rule; the divisive case of using anencephalic infants as organ donors; the sale of cadaveric or live organs; possible strategies for increasing the number of available organs, including market solutions and the idea of presumed consent; and questions surrounding transplant tourism and “gaming the system” by using the media to gain access to organs. 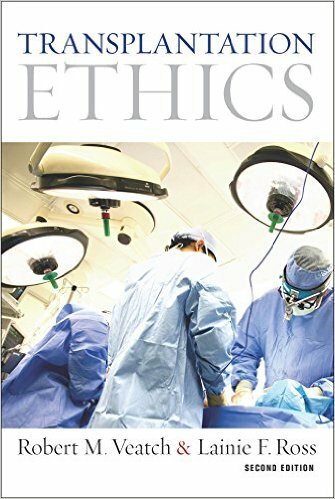 The author, Arthur L. Caplan, PhD, is the head of the Division of Bioethics at New York University’s Langone Medical Center and the author or editor of over thirty books and six hundred articles. Co-editor Father James J. McCartney is an associate professor in the Department of Philosophy at Villanova University and an adjunct professor in its School of Law. In the past he has been the ethics consultant for several major health systems in the United States. 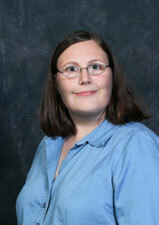 Daniel P. Reid, co-editor, is a recent graduate of Villanova University. This event, co-sponsored by Falvey Memorial Library and the Department of Philosophy, is free and open to the public. 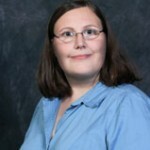 To learn more about the ethical issues surrounding organ donation, check out the following resources provided by Robin Bowles, subject librarian for science, biology, and nursing. A collection of news articles, editorials, Academic articles, and other related information covering the topic of Organ Donation for the undergraduate. The Fifth Summer School in Cognitive Sciences : Web Science and the Mind. Organized by the UQAM Cognitive Science Institute in Montréal (Canada), from July 7th to 18th. Theme of the Summer Institute: Web Science and the Mind. This summer school will present a comprehensive overview of the interactions between the web and cognitive sciences, with topics ranging from social network analysis to distributed cognition and semantic web. The Summer School will feature a poster session. Registration for the Summer School is open (”Early Bird” Registration fees until May 9th). Scholarships for travel, accomodation and/or registration will be available for students registered in a Quebec University (CREPUQ). We hope to see you there in July. Philosophy in the twenty-first century has seen an extensive reconsideration of formalistic methodologies and theoretical structures. This is heavily influenced by the formalism developed by a number of mid-twentieth century French thinkers who rejected humanist philosophies of experience or consciousness typified by dominant forms of existentialism and phenomenology. Insights derived from Marxism, Freudianism, and philosophy of science were argued to undermine central tenets of the latter, including the priority of description and the emphasis on first-person experiences. Rather, stress was placed on the priority of construction, an emphasis on the concept, and a rethinking of the nature of knowledge and the object of science. The recent history of formalist approaches is framed in important ways by Louis Althusser and Jacques Lacan. As is well known, Althusser rejected historicist and humanist readings of Marx in favor of a structuralist approach, which was amenable to the conception of science developed by thinkers like Jean Cavaillès, Gaston Bachelard, and Georges Canguilhem. Simultaneously, Lacan rejected ego-psychological readings of Freud, forming interpretive, theoretical, and clinical bases for psychoanalysis that drew on Ferdinand de Saussure’s structuralist linguistics and Claude Levi-Strauss’s structuralist anthropology. This led him to a methodological formalism, particularly when addressing the Real and the psycho-dynamics in which it is involved. The presence of Althusser and Lacan at the École Normale Supériere during this time formed the intellectual milieu in which students such as Alain Badiou, Jacques-Alain Miller, Étienne Balibar, and Jacques Rancière would begin to develop their own thought. An important forum for this was the journal the Cahiers pour l’Analyse (1966-69). The current project to translate it into English has prompted a surge in research related to these themes. In the Cahiers, efforts were made to reconcile Marxist politics with a Lacanian account of the subject. Lacan’s notion of the Real was essential to this and, along with the other elements of his thought, came to be developed by Badiou to address political and ontological domains. More recently, formalism in philosophy has expanded to address issues beyond these origins. For instance, formalistic reconstructions of Heideggerian and Husserlian thought have proved intensely productive and have problematized the opposition of philosophies of the concept to phenomenological philosophies. Moreover, recent efforts to address questions in aesthetics and politics with formal approaches has further expanded the boundaries of formalism’s theoretical scope. Paul Livingston’s book, The Politics of Logic: Badiou, Wittgenstein, and the Consequences of Formalism, examines the landscape of political criticism and change given the results and paradoxes of 20th century projects of formalization in mathematics and logic. Following this, his current project focuses on Heidegger’s philosophy, and will reexamine our inherited notions of sense and truth. After writing a book on Lacan’s concept of the Real, Tom Eyers has analyzed the intellectual foundations of structuralism in 1930s and 1940s French epistemology and philosophy of science. He is presently writing a book entitled Speculative Formalism: The Poetics of Form in Literature, Science, and Philosophy which will bring that work to bear on poetics and literary theory. In addition to translating Badiou’s Theory of the Subject and Wittgenstein’s Antiphilosophy, Bruno Bosteels has devoted numerous books to Badiou and issues in political thought. In his recent Marx and Freud in Latin America: Politics, Psychoanalysis, and Religion in Times of Terror, Bosteels investigates ways art and literature provide insight into processes of subjectification at the core of Marxist and psychoanalytic concerns. This summer symposium will bring together interested graduate students, postdoctoral students, and junior faculty for a week of discussion, lecture, and close textual study. Together, we will pursue questions regarding formalism and its relation to the Real in contemporary ontology, politics, and theories of the subject and their consequences for understanding knowledge, history, state, language, art, and literature. Lacanian and Badiouian thought will form a key theoretical backdrop. Yet, we expect our studies will include work by a number of other figures, including Plato, Marx, Nietzsche, Frege, Freud, Heidegger, Wittgenstein, Lautman, Bachelard, Canguilhem, Althusser, Deleuze, Derrida, Macherey, Miller, Butler, Jameson, Žižek, Hägglund, and Malabou. All texts and discussion will be in English. In order to facilitate a further exchange of ideas and research, a participants’ conference will be held the weekend before the seminar begins. Applicants who receive notice of acceptance as participants will be asked – if interested – to submit an abstract of up to 500 words on any theme related to the topic of the seminar. The participants’ conference will take place on Saturday and Sunday, August 2-3, 2014. There will be a $200 registration fee for each participant of the seminar. This money will be used for event expenses like a conference dinner, celebration, daily coffee, etc. Please note that participants will be responsible for arranging their own housing as well as financing most of their own meals for the duration of the symposium. However, with respect to lodging, we expect a limited number of arrangements with graduate students will be available on a first come, first serve basis. Think of Climate Change, Wikileaks, nanotechnology, Responsible Innovation, neural implants, Linux, GMOs or the German Energy Transition. But when we think about it, do they actually exist? And if they do what should they be like in the future? What exactly are they? Are they symbols, technical artifacts, discourses, constellations of actors, scientific disputes? Are they political issues, societal problems, human-nonhuman-hybrids, modifiers of existence, problems for governance and regulation? In a way, they are all of these things and less – and probably more. They are what this Summer School refers to as “knowledge objects”. These objects are peculiar, blurry, constantly unfolding and transforming entities that increasingly challenge contemporary societies and sciences and our understanding of knowledge. The knowledge in knowledge objects is always plural: scientific, public, mundane, interdisciplinary, speculative, uncertain. It is heterogeneously produced about, with, through or in them and contributes to their identification, contestation and transformation. Yet, knowledge objects are also enablers of such knowledge productions and the societal controversies that go along with them. This intricate entanglement of knowledge objects and society poses various normative and regulative questions – which are part of these objects and due to them the problems societies face. This entanglement could be viewed as a fundamental challenge for knowledge governance. To address these complex challenges to societies and sciences, the Summer School aims to bring together two strands of science and technology studies (STS) which so far haven’t combined: the focus on “knowledge objects” and the perspective of “knowledge governance”. The starting point of this summer school is the assumption that knowledge objects are subject and object of knowledge governance. They create the need for and they enable various forms of knowledge governance. In a way, this synchrony is a black box of knowledge governance. The Summer School proposes that this “governance black box” can be opened by focusing on an extended concept of knowledge objects and by analyzing their governance dimensions. Applications are due by 28th March 2014.